It is nice to enjoy the beautiful blue skies of Amarillo! I cruised back into Amarillo this afternoon. I am looking forward to reconnecting with Charlene, Amy, and Neil. It will be wonderful to see them! It is amazing how big Texas is. This is a huge loop and I thoroughly enjoyed seeing a large section of Oklahoma, the opportunity to spend time with John and Michelle, and the chance to spend time in Abilene and Lubbock. 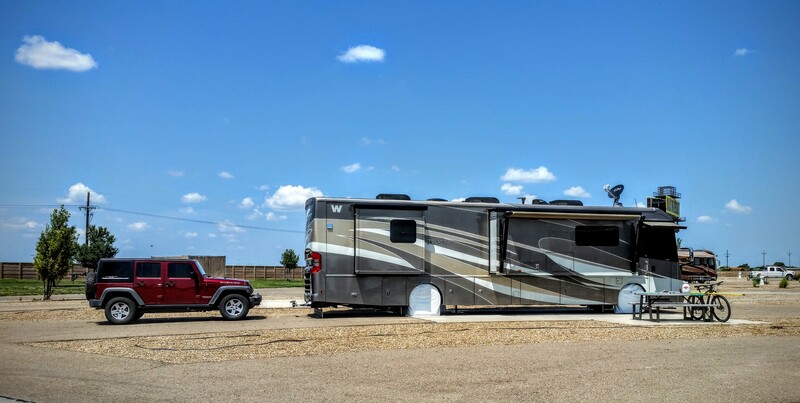 I am also glad I identified some nice RV parks for future trips around Oklahoma and Texas. Now it is nice to get the coach setup and enjoy the beautiful blue skies of Amarillo. I am also grateful that it is only 88 degrees. I am loving the cooler weather! Check out the huge driving loop I just completed!